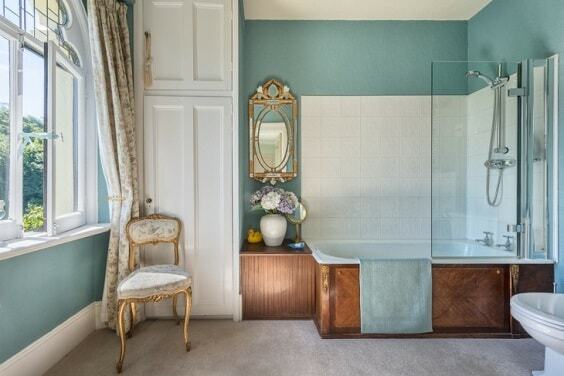 As an essential part of a house, a bathroom should look and feel as inviting as possible. It’s the room where you always do your basic needs as a human being every single day. 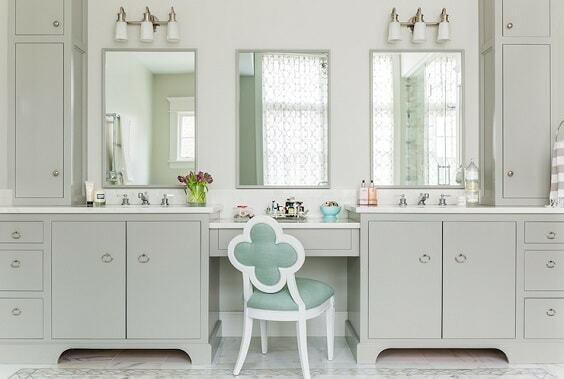 For some homeowners, decorating a bathroom with some casual accessories and furniture are just enough, but not for others. They try to make their bathroom decor look uniquely catchy by playing with the layout. 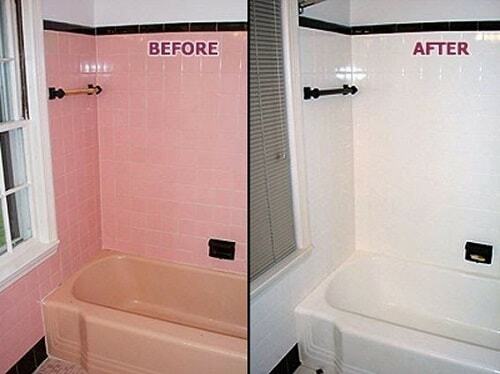 The gothic bathroom decor is one of the best choices when it comes to a distinctive bathroom. It’s surely not a popular decor theme, so you will have a bathroom which doesn’t look like the common ones. 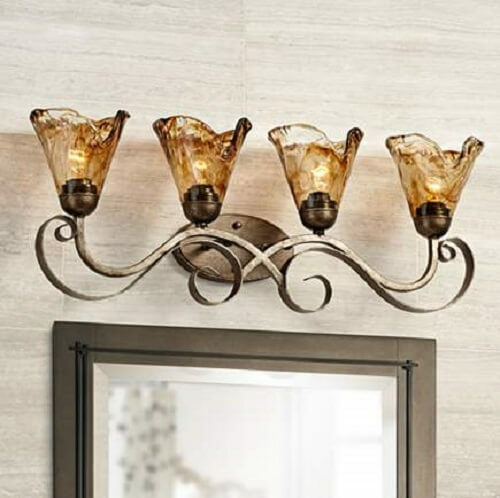 Here, we have picked stylish and captivatingA�gothic bathroom decor that you can try to copy for your very own bathroom. 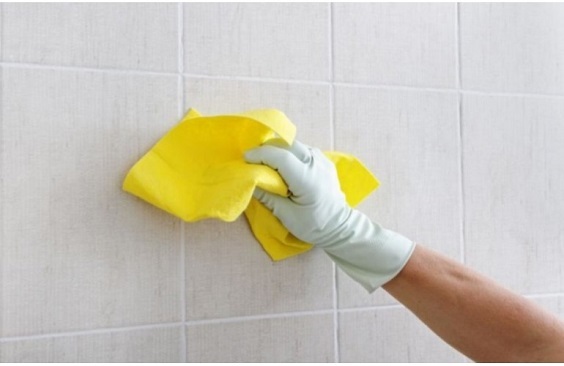 They are totally worth to include on your inspiration list when you want to remodel the decoration of your bathroom. Shades of grey can be the best color to choose when you want to have a gloomy yet a quite bright gothic bathroom. Here, the matte grey gives such an exquisite look with the calming atmosphere that you will love. To strengthen the gothic nuance around the room, the white chandelier and firepit are installed beautifully. Yeap, a gothic decor doesn’t always relate to dark or even spooky look. Just like this mesmerizing inspiration which uses soft pale yellow to colorize the room dominantly. 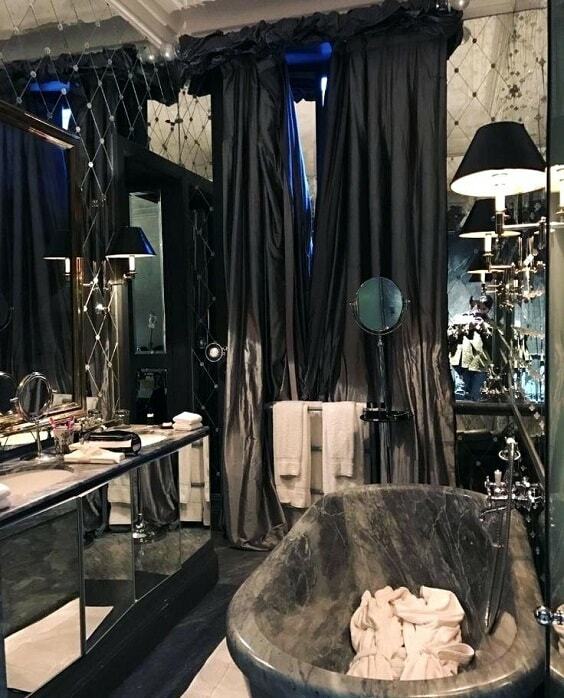 The major factor which pops up the gothic look in this bathroom is obviously the window which then enhanced by the decorative toilet, bathtub, and sink. Though we keep saying that black is not always the color of gothic decor, it still actually works for you who love something classic. 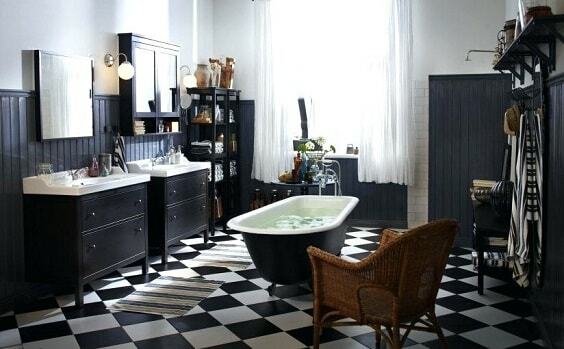 This one shows the gorgeous way to use black as the overall look of a gothic bathroom that you can copy. The gorgeous gothic bathroom in a combination of white and blue which looks brightly stylish. The design of furniture and accessories around the room gives a gothic atmosphere beautifully and slightly reminds you of the Victorian era. Furthermore, the gold and wood finish of the bathroom stuff here gives a nice colorful touch to the neutral-colored wall cleverly. 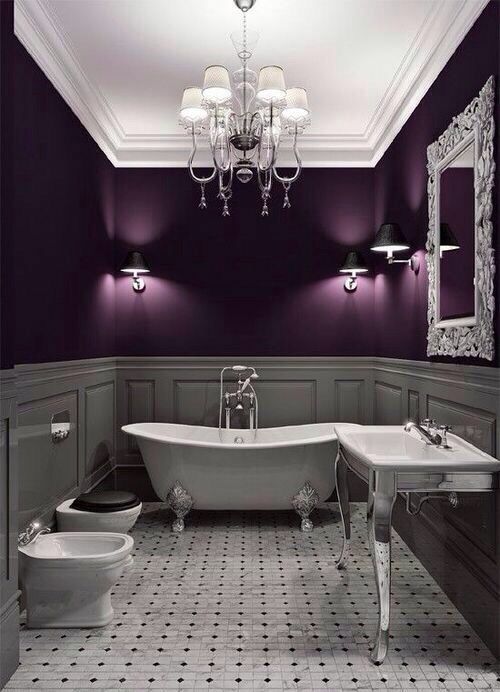 Instead of using solid black as its overall look, this bathroom uses the deepest shade of violet for its layout. 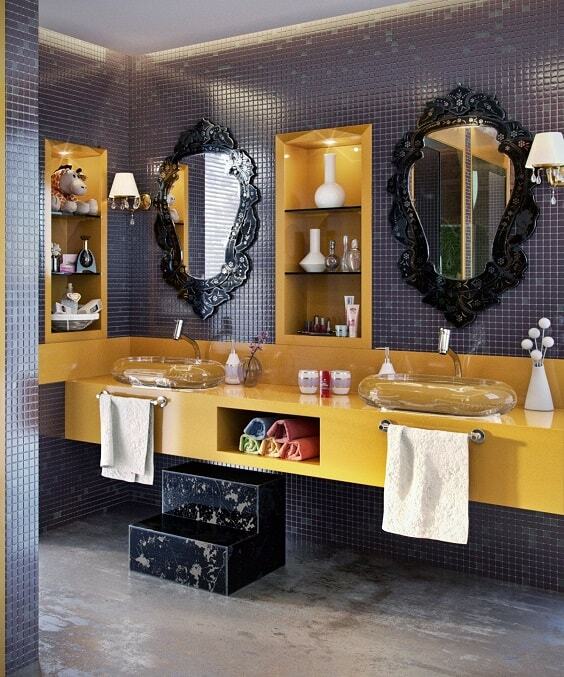 Then, the black, white and silvery bathroom accessories and furniture complete the decor perfectly. You can also see how the marble-like flooring gives a more festive touch to the bathroom beautifully. 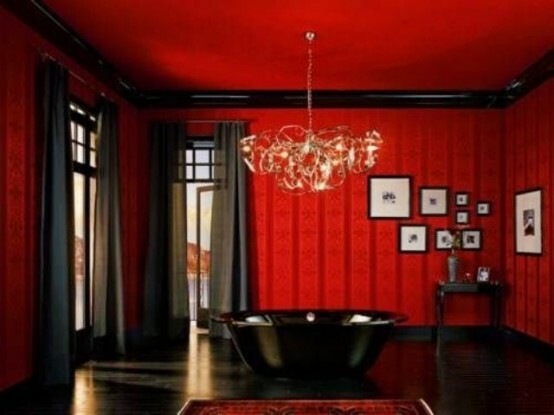 If you prefer the solid vibrant color for your gothic bathroom, then red can be one of the best options. Here, the deep yet contrasting red colorizes the wall and the ceiling to create such a warm and spooky atmosphere. Then, all the furniture and accessories (including the flooring) are finished in black which enhances the room’s gloominess. Who says that you can’t have a festively decorative bathroom when you choose the gothic theme? Well, this inspiration tells you how to make the one which you can try to copy. The decorative tiles with blue and green finish dominate this all-white bathroom which then flows gorgeously with the rustic furniture and accessories around. Another gothic bathroom decor which uses a window as the key to creating such a gloomy nuance. 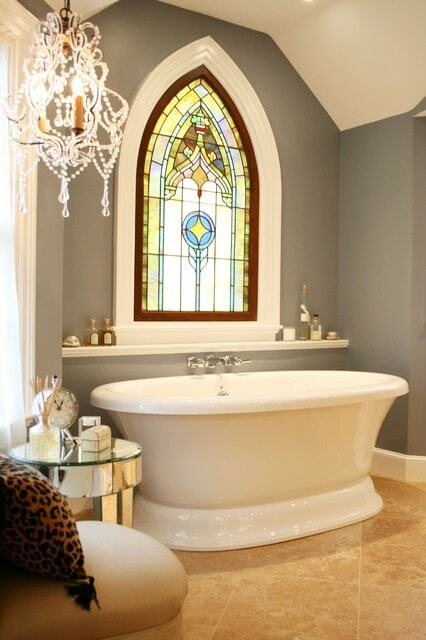 The Victorian-style window with decorative glass is used to influence the add another style to the bathroom layout. Other bathroom stuff is kept simple to let the window becomes the major focal point here. The beautiful gothic bathroom with the rustic nuance which will give you an exhilarating nuance of a natural spa. As you may have noticed, the ceiling design and (again) window are the main factors that add the gothic style to this bathroom. 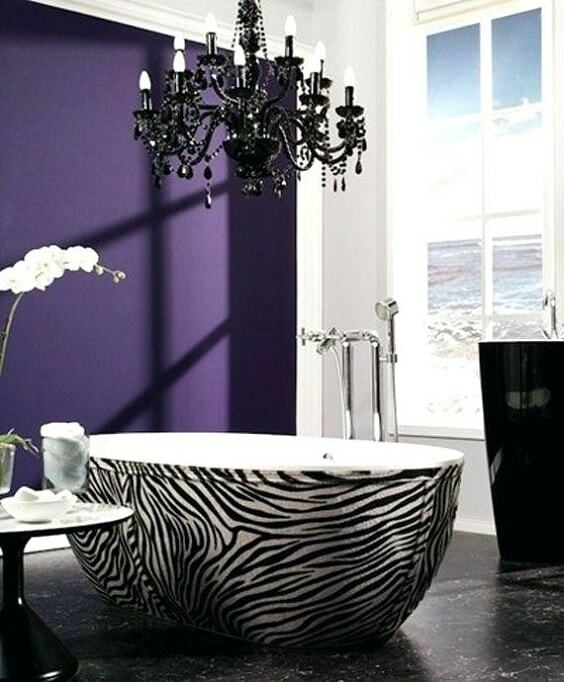 Yeap, shades of purple is quite popular when you want to make your gothic bathroom look more beautifully colorful. It gives a nice color while still making the bathroom feels gloomy. Here, the deep purple is combined with white and silver which create a luxurious gothic atmosphere in a very stylish way. If you want to go more obvious with your gothic bathroom, this catchy idea should be included on your inspiration list. Here, some spooky gothic-themed decor items like the crows statue decorate the layout uniquely. The walls are painted with the rustic finish which gives the room a gloomy rustic touch gorgeously. 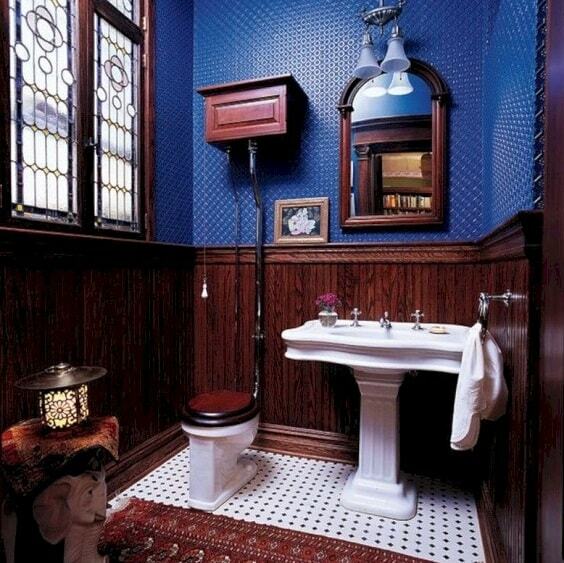 The layout of this gothic bathroom sparks out the classic atmosphere due to its overall color and furniture choices. 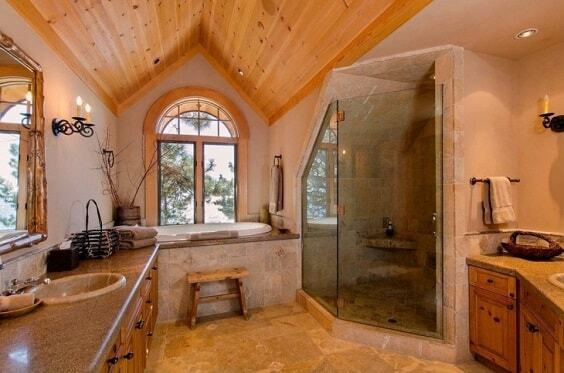 It has a granite flooring, shower area, and countertops which pops out a decorative yet calming touch in a more earthy. 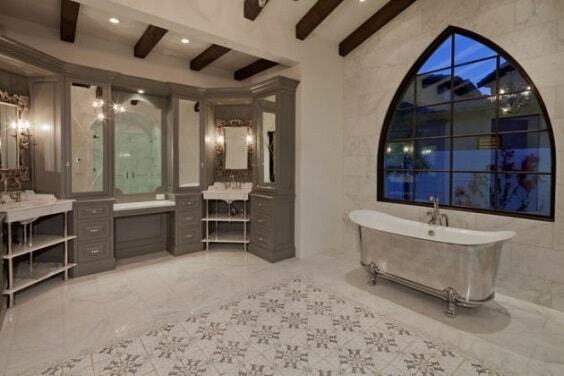 The beautiful gothic bathroom which adapts the traditional look of its style. You can see the exposed wooden beams on the ceiling gives a nice touch which emphasizes the classic nuance of the room. 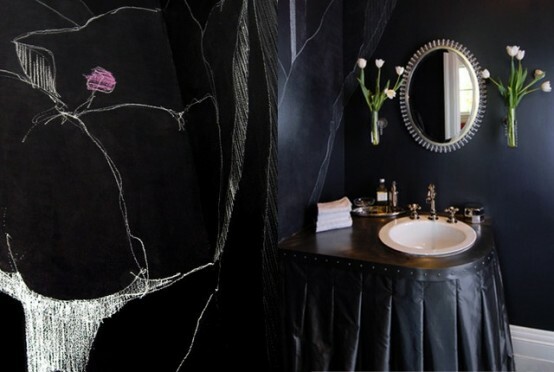 Making an all-black gothic bathroom look more decorative is surely one of the great options to make it become more attractive. Here, the solid black wall is decorated with brick-style black and white tile which looks so catchy. Then, the festive flooring is also chosen to give a more decorative look. 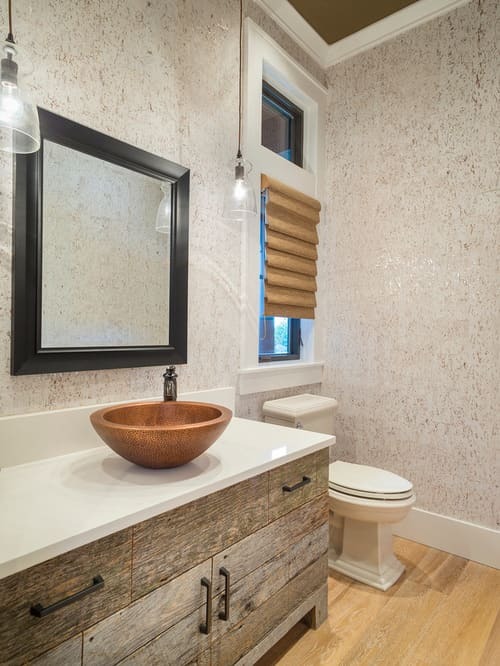 Though this one is a narrow bathroom, the decor items are fully filled the room stylishly. 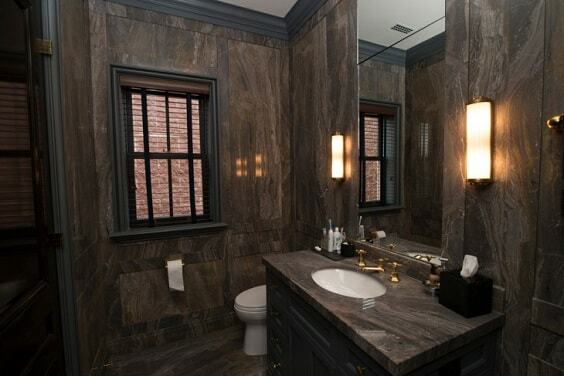 The dark gloomy bathroom which uses deep marble wall and flooring to create a gorgeous gothic nuance. It’s completed with the classic style window and vanity which enhances the beauty of the room very well. 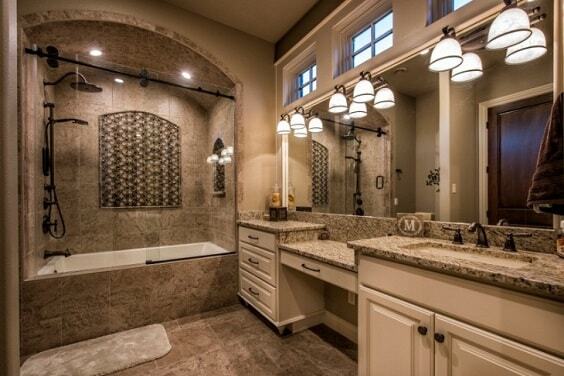 A tall wide mirror is then installed to create a wider look to this narrow bathroom. 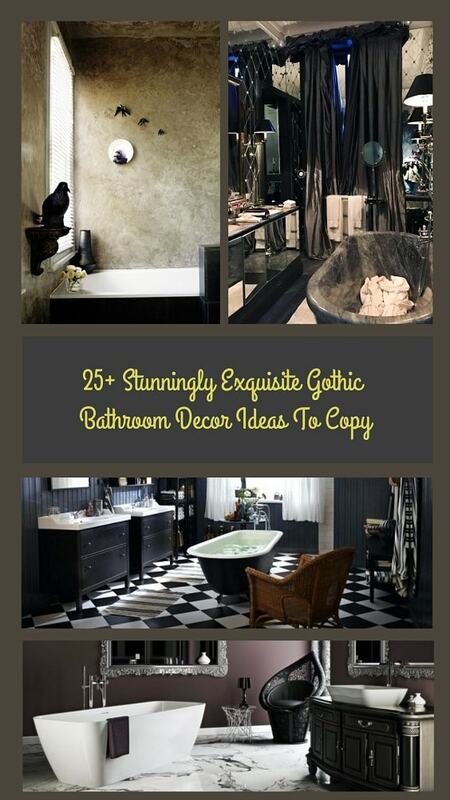 The chic gothic bathroom decor with a nice black and white look which is so inspiring to try. It has such a smart choice of furniture, accessories, and layout which creates such an inviting atmosphere stunningly. 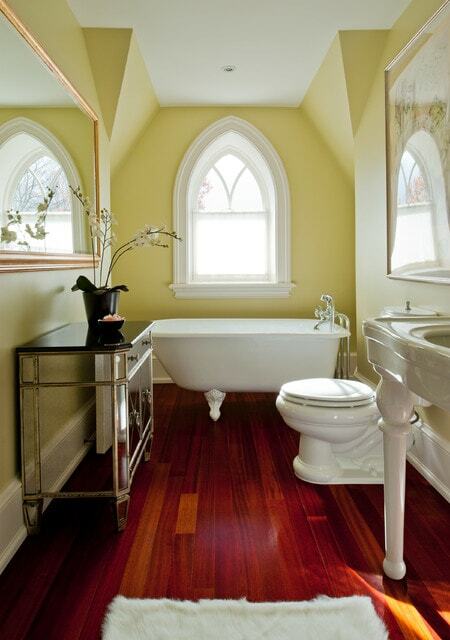 The beautiful decoration of this gothic bathroom idea works well for you who love to create a more feminine layout. Agan, shades of purple and violet are chosen to pop up the colorful yet gloomy touch. Notice the choice of furniture which combines the traditional and modern ones in one layout wonderfully. The uniquely catchy gothic bathroom decor which combines vibrant solid blue with rustic wood look for its layout. 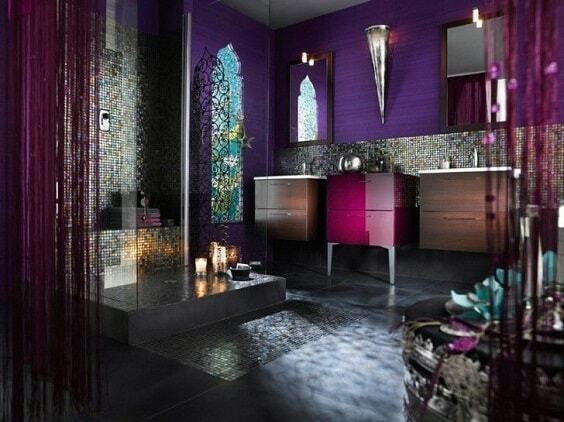 Such combination creates a colorful yet gloomy nuance which is perfect for a gothic bathroom. 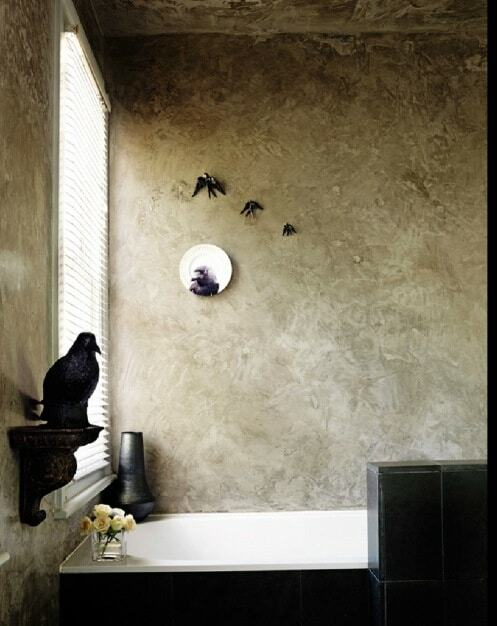 Here, the minimalist, gothic, and rustic touch are combined cleverly to create a beautiful gothic bathroom decor. The bathroom loos distinctively admirable with its color combination and furniture choice. You can see how a yellow wall-mount vanity is matched with the gothic mirror and rustic step which is surprisingly awesome. 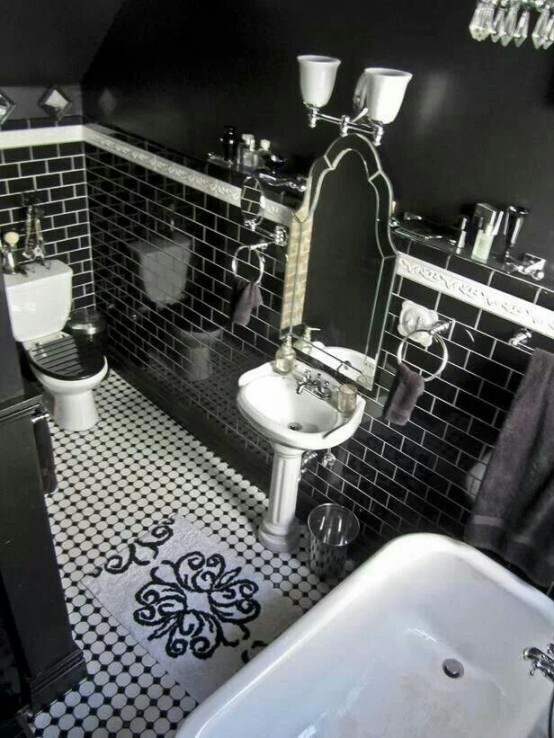 It’s always a safe way to choose black as the main color for your gothic bathroom, then the next job is to pick the right shade to colorize it. Here, gold is chosen to add a colorful touch to the all-black nuance which creates such a glamorous look beautifully. 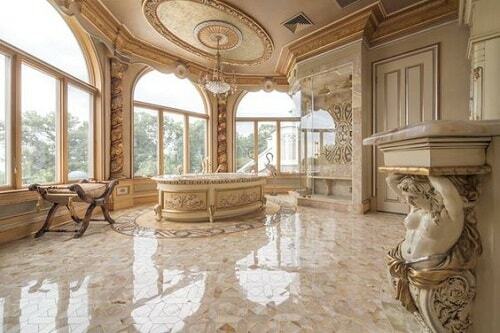 Yeap, gold is always the right choice when you want to have a glamorous bathroom and applying the color to the gothic decor is surely a good idea. 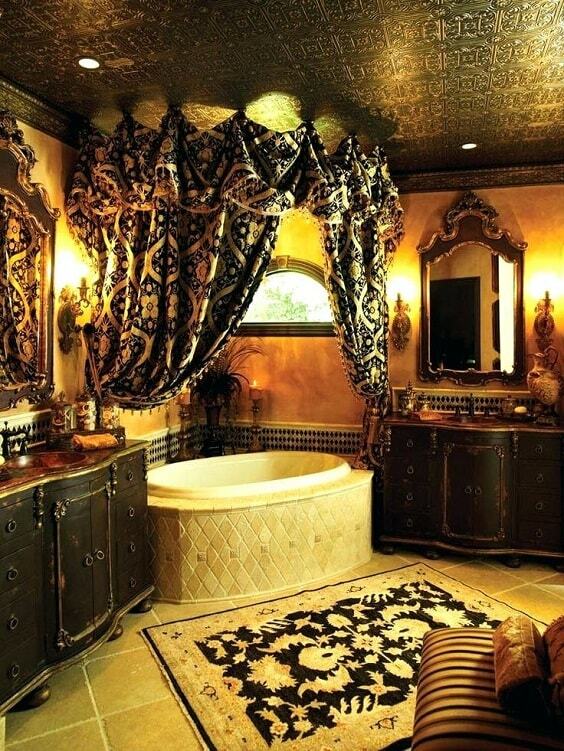 This one is an all-gold bathroom with decorative furniture and accessories in the deep brown shade which looks so stunning. Then, the light is kept diming to create a gloomy warm nuance around the room. You can instantly feel the gloomy atmosphere in this bathroom at the first glance with its spooky decor items. 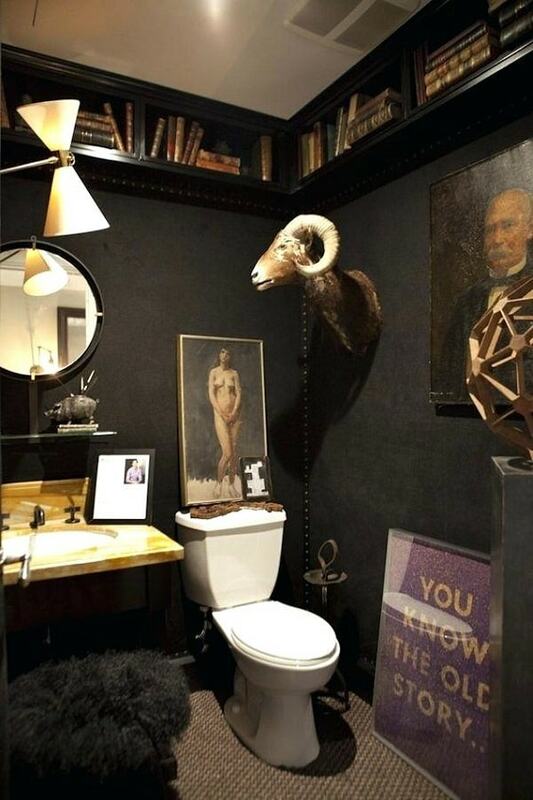 It’s basically an all-black bathroom which is filled with lots of unique stuff to create a superb gothic layout. The brightly stylish gothic bathroom gothic bathroom with the very chic layout that will make your bathroom look and feel so inviting. It has a nice combination of matte purple and white which is decorated with some gothic-themed furniture and accessories. 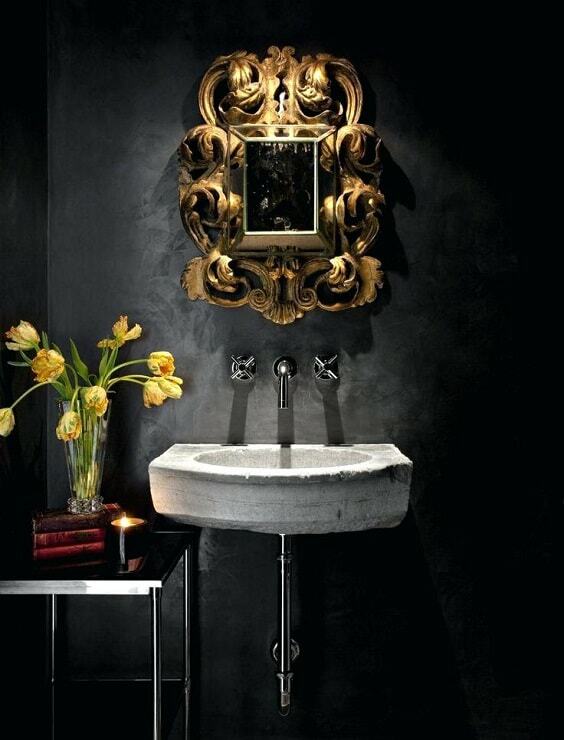 The stunning gothic bathroom with a black layout which looks more luxurious with its decorative mirror wall. Since it’s a long narrow bathroom, the mirror also gives a wider impression beautifully. Those are some inspiring gothic bathroom decor ideas that you can use as your ultimate reference when you want to have such decor. 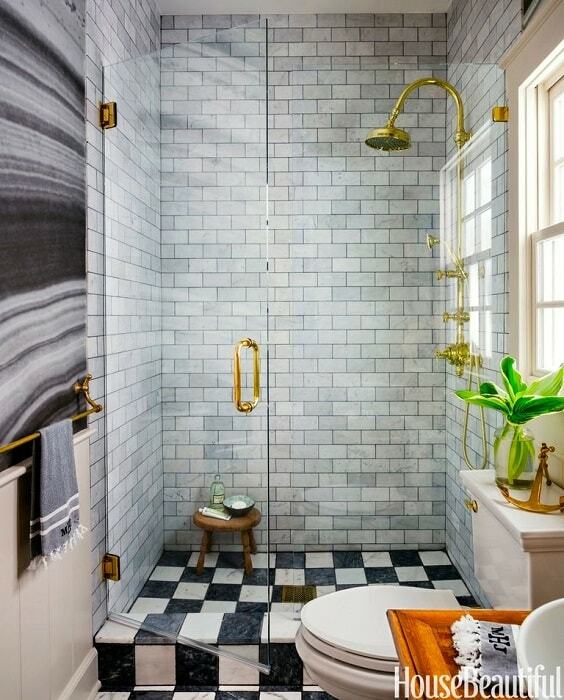 You can easily try one of theA�themes to be your very own unique bathroom. Choosing theA�gothic style for your bathroom is always a great idea when you are willing to have a distinctive bathroom. It doesn’t mean that you will have such a scary bathroom when you want to go with gothic if you know how to make it properly. 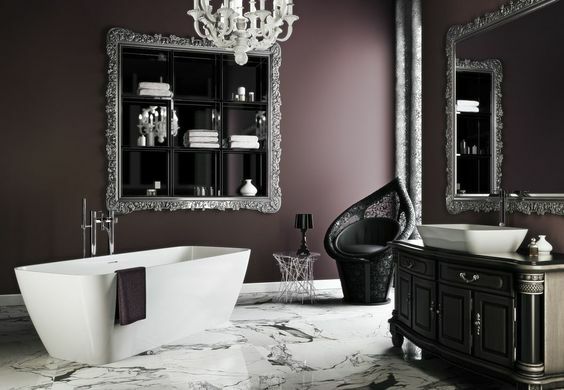 Below, we have some brief tips that you can consider when you think a gothic theme is a perfect style for your bathroom layout. 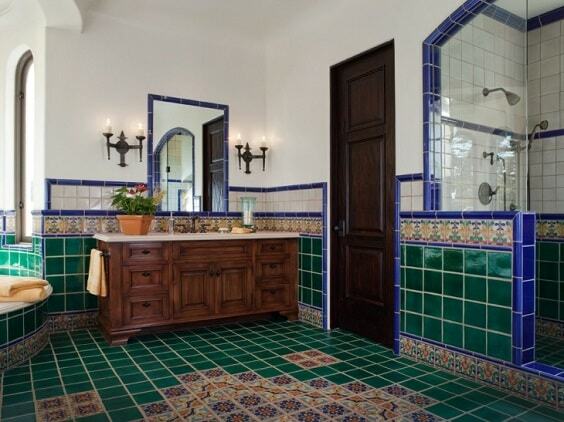 The key to makingA�an inviting gothic bathroom decor is mainly about the color choices. It may be true if black is like the basic shade to make a gothic bathroom, but it’s not a must-do thing that you have to apply. Purple, red, or blue can be some color options that you can play with for our own gothic bathroom. 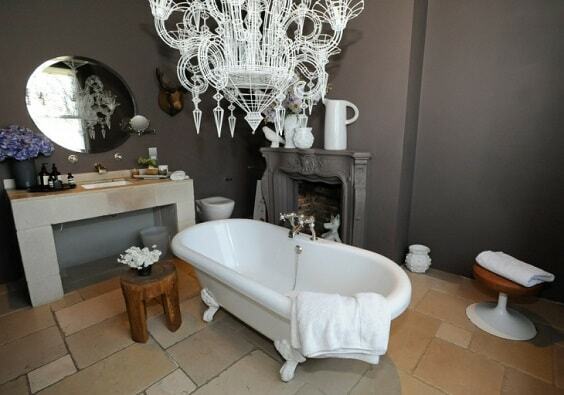 They can create such a particular atmosphere that a gothic bathroom will give you. Another thing to consider is mixing the gothic layout with some modern bathroom furniture and accessories. 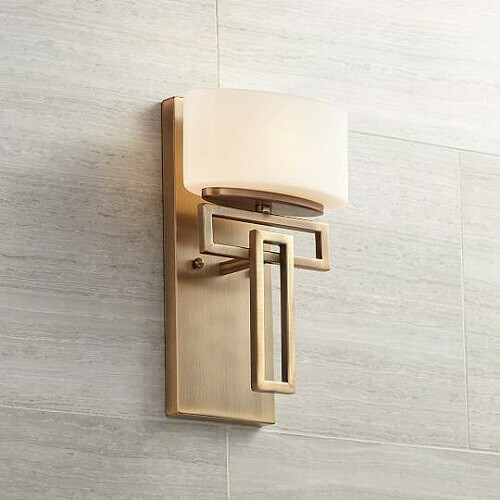 You can go with some minimalist vanity, lights, or other accessories set. Now, you already have a great list of gothic bathroom decor with some brief tips how to create it properly. 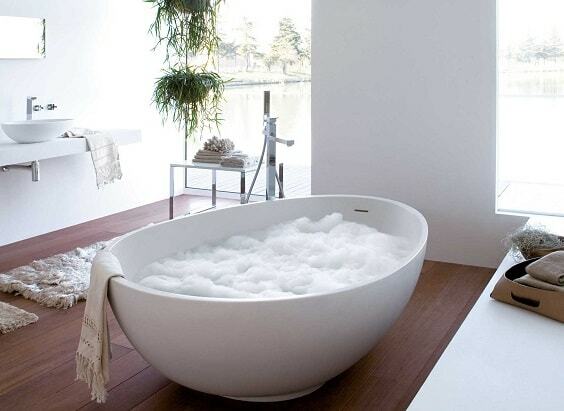 It’s surely the right time to apply the idea to your beloved bathroom!